It's one thing seeing a finished painting, but I love to see the process. If a painting has a process, it also has a story. It's like when you meet someone new, it's difficult to form an opinion on them, until you know a bit about them. Well I want to introduce you to my newest seascape 'Silk Bandage'. Those first few marks are always the most satisfying for me. I love working large and using my big ol' brush to get those beastly brush strokes on the canvas. At this point I'm thinking about colours and playing with structure. I suppose it's a bit like a drawing at this stage. Outlining, imagining. I used a water spray to get some interesting texture in the sky and carved out my clouds with my favourite colour right now, Powder Blue. I find this bit so exciting because I really enjoy the mixture of the bare, organic background, mixed with decisive brush strokes. 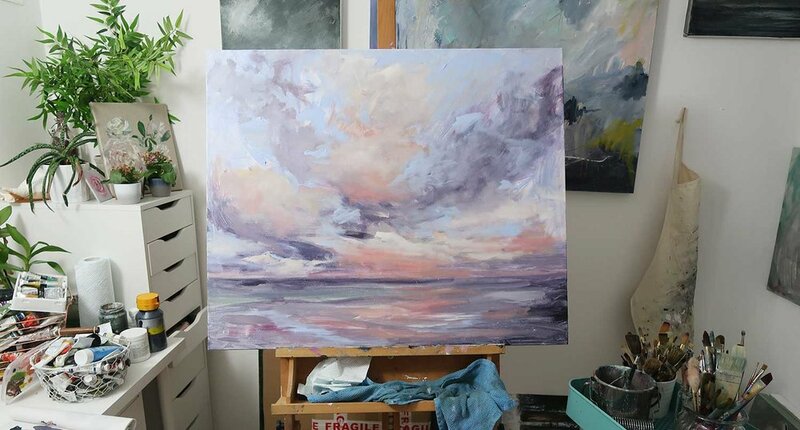 I like to add many thin layers of colour, which ultimately build up and create an atmospheric look in the clouds. It's a game of tag between colours and light vs. dark. 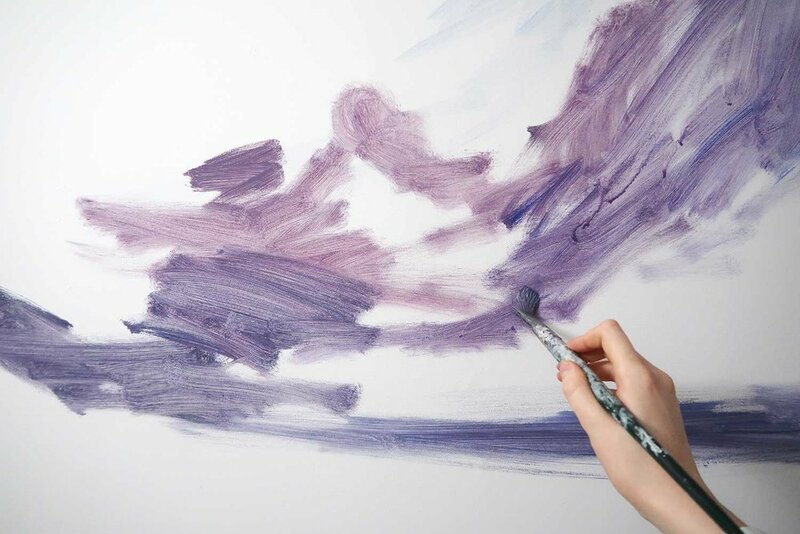 I push and pull with the paint until I find a happy medium, and feel like it looks balanced. This often ends up with a mixture of blending and harsh brush strokes. Palette knives are my all-time favourite for adding texture. There's just so much you can do with them. Using my palette knife, I score the paint along to mimic waves. Dragging it back and forth with its flat side against the canvas, picks up the texture of the canvas. I use this in a lot of my seascapes for the water to create a feeling of reflection. I used oil paint in my final layer. I adore oil paint for a million reasons, but one of them is it's intensity of colours. Even when the paining is dry, the colours are so beautiful and rich. 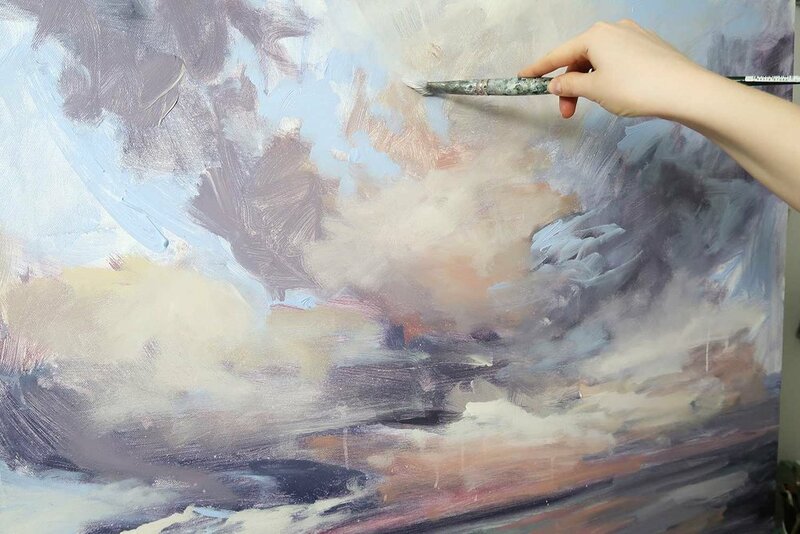 I absolutely loved the process of this painting and I felt so peaceful when painting the tranquil clouds. I named this piece 'Silk Bandage', like a beautiful sadness. We all go through rough times, and for me, painting is a way to cope. It's a peaceful haven, during a storm. A place where I can come and be quiet, to document my thoughts in colour form. Hopefully this explains the name a bit more, and why we need to find beautiful things in times of tragedy. You can find this piece for sale here. It is currently looking for a new home, and to offer peacefulness to somebody's wall. If you have any questions about the piece I'd be happy to answer them. Just drop me a message at shop@katiejobling.com.